The King is Dead. Long Live the People! Mareth is a bard, a serial under achiever, a professional drunk, and general disappointment to his father. Despite this, Mareth has one thing going for him. He can smell opportunity. The King is dead and an election for the new Lord Protector has been called. If he plays his cards right, if he can sing a story that will put the right person in that chair, his future fame and drinking money is all but assured. But, alas, it turns out Mareth has a conscience after all. Neenahwi is the daughter of Jyuth, the ancient wizard who founded the Kingdom of Edland and she is not happy. It’s not just that her father was the one who killed the King, or that he didn’t tell her about his plans. She’s not happy because her father is leaving, slinking off into retirement and now she has to clean up his mess. Alana is a servant at the palace and the unfortunate soul to draw the short straw to attend to Jyuth. Alana knows that intelligence and curiosity aren’t valued in someone of her station, but sometimes she can’t help herself. And so she finds herself drawn into the Wizard’s schemes, and worst of all, coming up with her own plans. 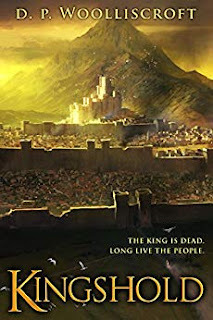 Chance brings this unlikely band together to battle through civil unrest, assassinations, political machinations, pirates and monsters, all for a common cause that they know, deep down, has no chance of succeeding – bringing hope to the people of Kingshold.